NR#1 1 star hotel in Eindhoven! Obviously we can be reached well by public transport and there is free parking in front of the door. 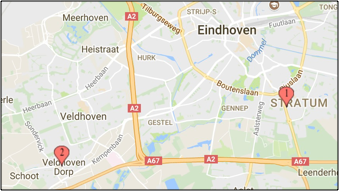 Because of its location, Lightotel is easily accessible via the A2 exit 33 Leenderheide, then follow the center. On your right you will see Lightotel; recognizable by the blue color and flag in the front yard. By public transport you take bus 173 from the central station and get off at the Korianderstraat. Lightotel is a 1-minute walk from the stop, Leenderweg 285. NR#1 1 star hotel van Eindhoven! Looking for a hotel in Veldhoven?